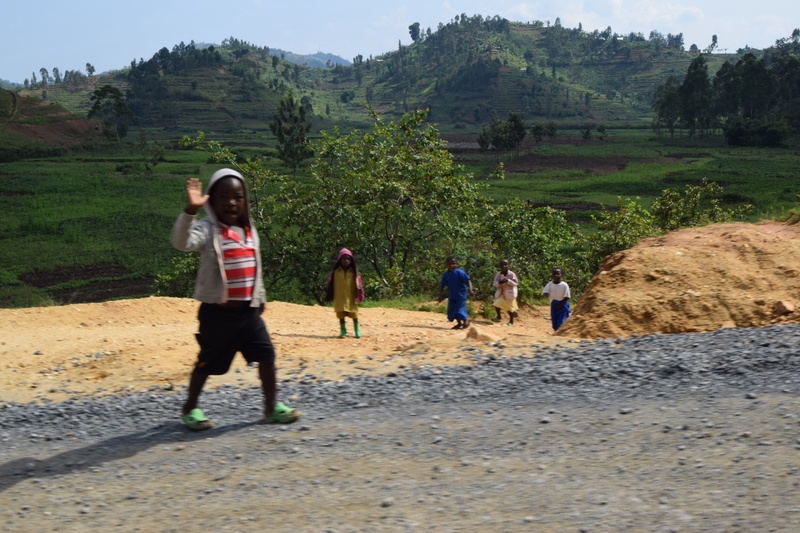 The roads of Rwanda… I take it all back! Just like the little girl with the curl, it has to be said that when they are good, they are very very good, and when they are bad, they are horrid. 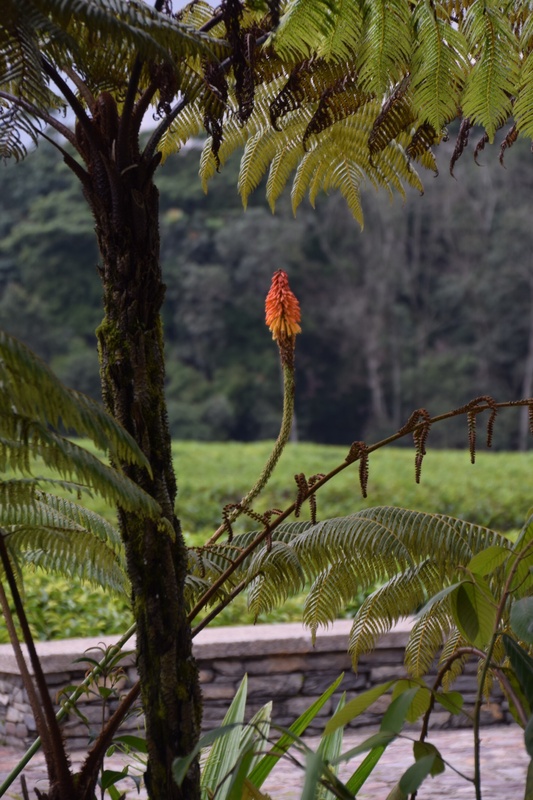 Monday started in Nyungwe Forest Lodge with a much more civilised pick up time of 8am, ready for our next long drive. 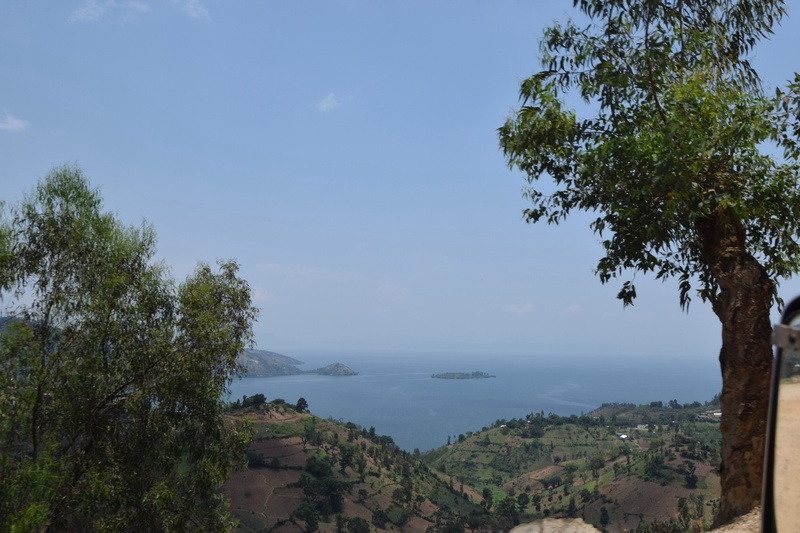 We set off to follow the Congo Nile trail, along Lake Kivu, up the western border of Rwanda. 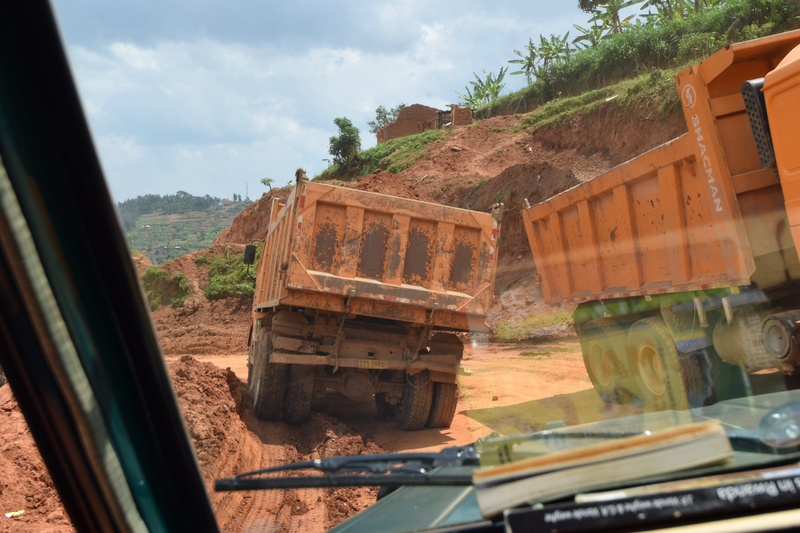 Billed as a 10 day hike, 5 day (mountain) bike ride or 2 day drive (but only for very patient 4WD drivers, the brochure says), it turns out that the actual road is one of the Republic of Rwanda’s major works in progress! 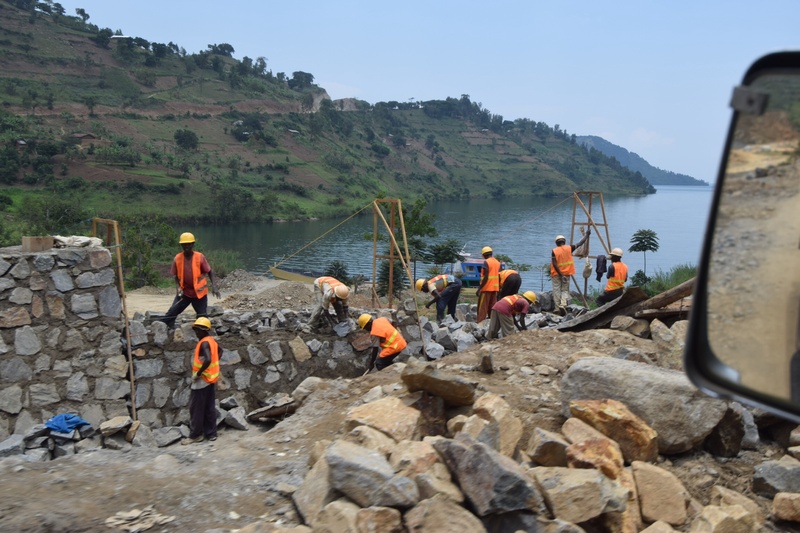 It takes us 4 hours to do 93km, most through the most astonishingly massive roadworks and earth moving I have ever seen. There are patches not yet attacked – basically a badly rutted bumpy trail, and patches where the final product is tantalisingly showcased – a real road, perfect in every way. 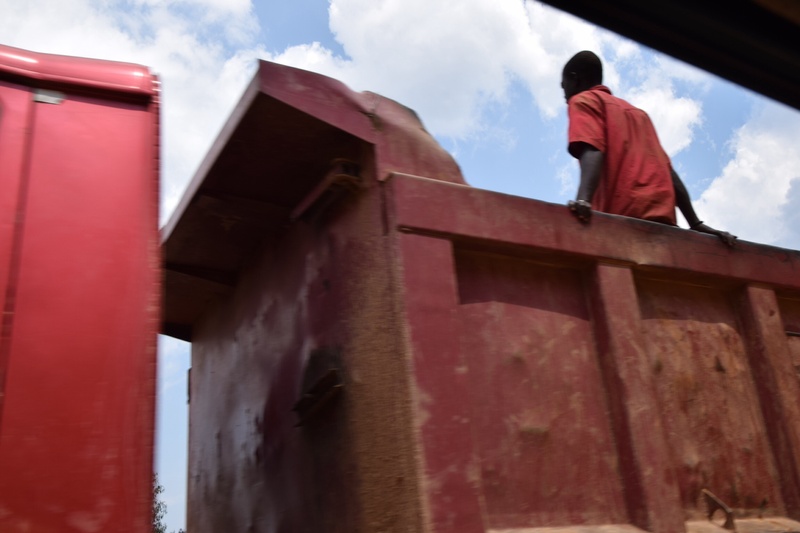 When this route is finished, the container trucks to Burundi will no longer need to go through Nyungwe Forest. I ask our driver how long this project has been going… thinking about how long it took to almost build a motorway from Auckland to Hamilton, a similar distance. 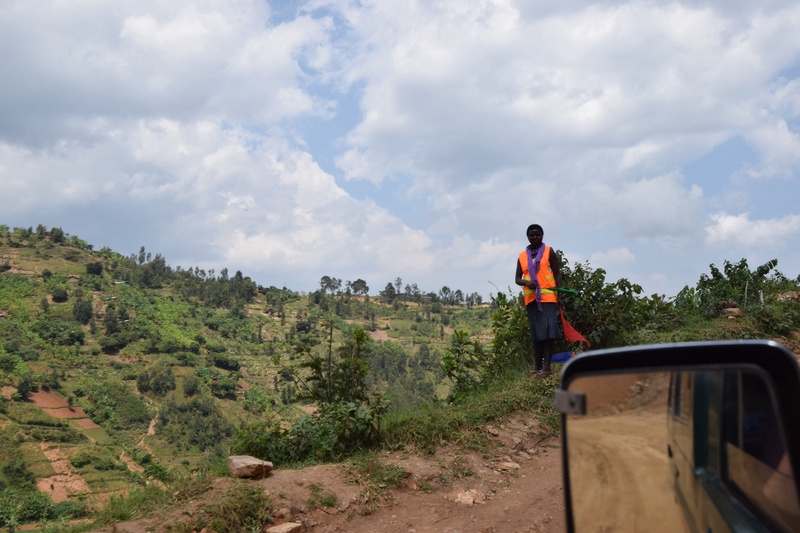 And of course, beating in mind that this is not a simple road; this route winds around, up and down at least 50 or more of this thousand hills or which Rwanda is famous. Two years, he says. I am stunned, expecting maybe 5 or more given the scale we have seen. 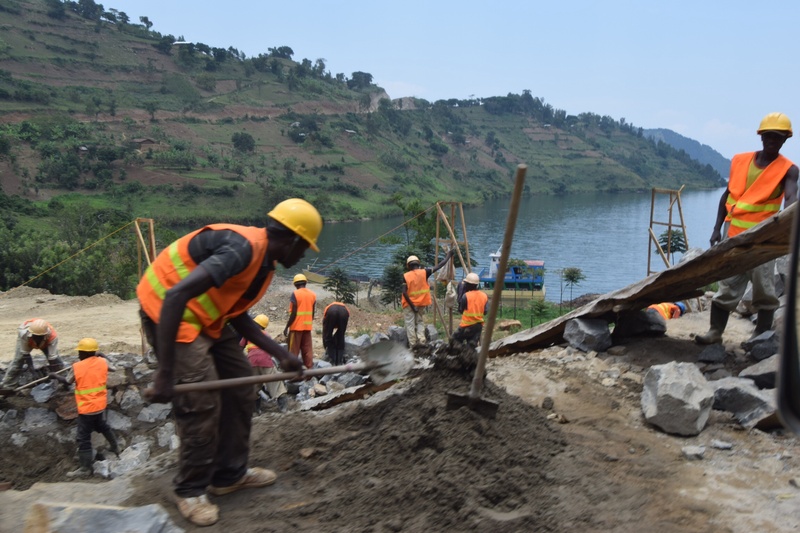 No, he says, when the government tenders the project, the consider the resources that the company has available to finish the job quickly. 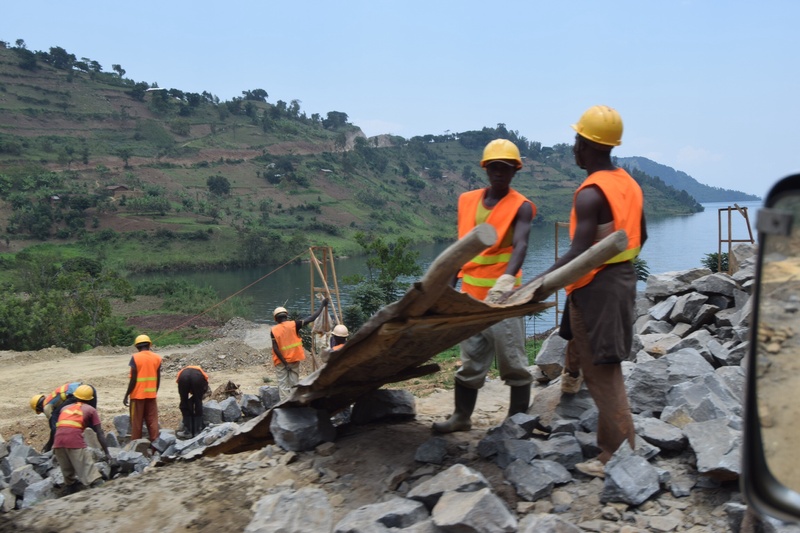 China Roads won the tender, and has certainly brought their resources to bear, while also making full use of local labour. Amazing. I think about the rebuild of Christchurch and how much more might have been achieved by now with a similar philosophy. 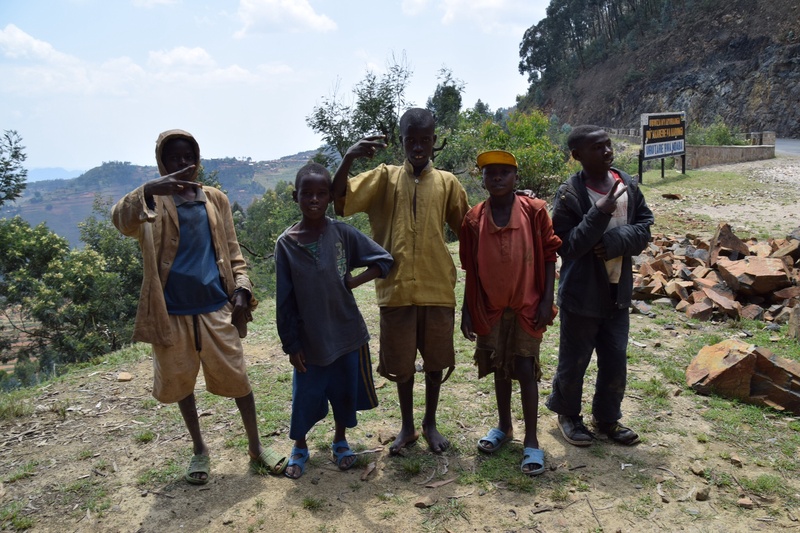 We get to the end of the trail – a town, a lunch stop at a truly African ‘restaurant’. I feign vegetarianism, choosing rice with curried banana, coleslaw and avocado, with a side of fries. That pot of boiled chicken just didn’t do it for me. But it is was certainly good to have some respite from the “African massage” that is the bone jangling bumpiness of the ride so far. Back on tarmac after lunch, we still have 5 hours to go! 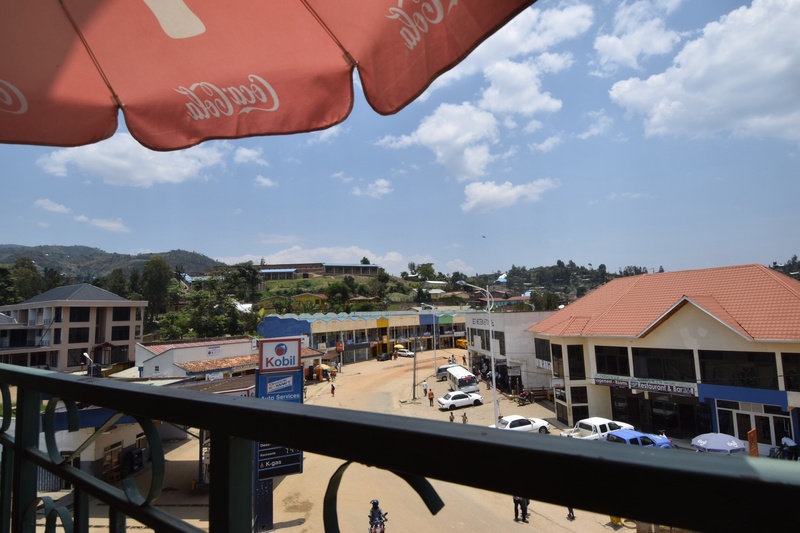 We arrive at Gorilla Mountain View Lodge – in retrospect, probably not the best choice, only on account of its altitude – late afternoon, with one more (downhill) speeding ticket under our belt. On closer examination, it’s not the the speedometer doesn’t have a needle, it’s just that the mileage counter has been disabled, and this clearly means the speedometer doesn’t work. If you’re doing zero miles, you must be going at zero miles an hour! 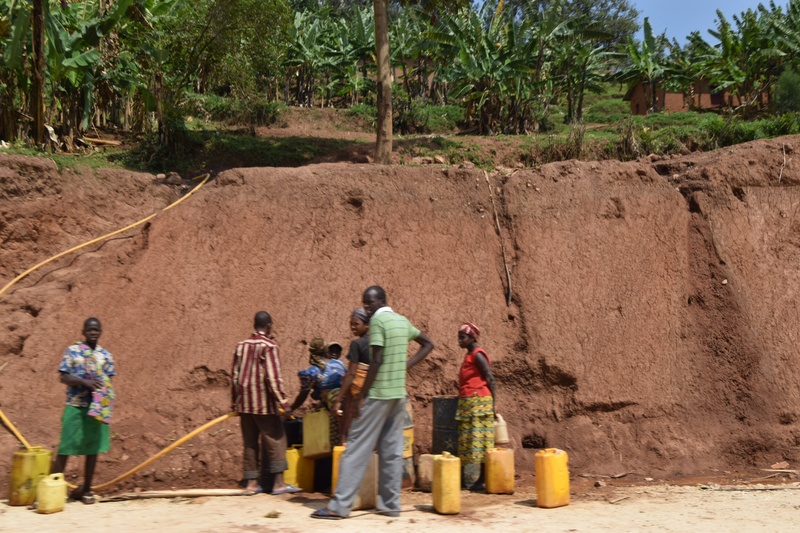 Emmanuel says he’s going back down to the town to sleep – not enough air for sleeping up here. But in every other way, this lodge is perfect. None of the affluent luxury of Nyungwe, this lodge is straight out of old Africa, think Cathedral Peak, complete with a dinner gong, red polished concrete floors, and a giant room with its own fireplace. The temperature at night falls below 20C, so we must need a fire in the bedroom (no thanks!) despite the not one but two heavy duvets, plus blanket on the bed. Tomorrow – gorillas! The excitement is mounting… We share a bottle of South African Merlot, and head off to bed. i download photos from my camera – no internet. I have dozens of bad, out of focus snaps of things that caught my eye out of the window of the Landcruiser as we zoomed by. 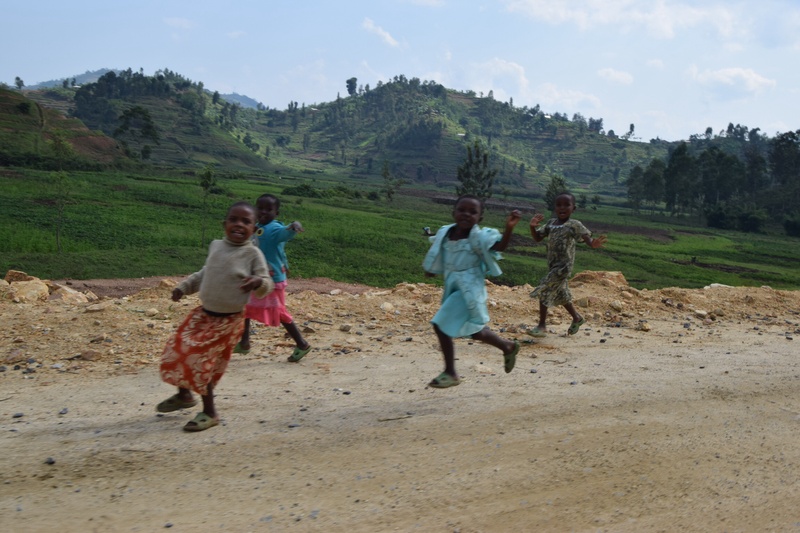 This is Africa, poor, but happy, vibrant and alive.